Some may be surprised to find that cool high tops exist outside of the 1980s, but they do. They're a great way to add support for your ankles and color to your outfit, and yes, in some cases, they do add a retro flair. A lot of styles are designed for skateboarding or playing basketball, but who's to say that you can't just enjoy them all day, every day, whether you're into sports or not? Some brands are just known for their awesome high tops. A true Chucks fan may not even acknowledge the existence of other cool high tops. Why should they? There are so many colors and patterns available, they can change things up without ever straying away from the brand they love. Classics are always cool, and the Chuck Taylor All Star is definitely that. It's available in Black Monochrome, Optical White, Pink, White, Black, Red, Navy, Green, and Maroon. The All Star style is also available in stripes, vintage, and more. You can even make them cooler by learning a new lacing technique. If you're feeling especially creative, you can visit the Converse website to design your own. You can't go wrong with Nike Dunk High sneakers. These are some of the coolest, brightest shoes around. Visit Pick Your Shoes to see a wide variety. Even the soles are colored. There's more to them than just splashes of color-you can choose prints, too, like the argyle sections on the Nike Dunk High Premium. Other cool Nike picks include the Jordan Nike Air Retro canvas high tops. 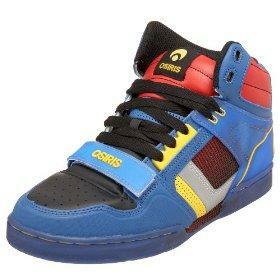 Osiris high tops have great customer reviews and plenty of color schemes to choose from. There's even a version for kids and toddlers. You can choose from neutral base colors with pops of color, like the Brown/Tan/Cyan mix, plain black, or go all-out and choose the Blue/White/Red mix. There are nine different combinations to choose from. Many of the Osiris shoes are low-cut, but the Bronx's color selections, relatively low prices, and comfort make up for it if you're searching for your perfect high tops. Vans are some of the best-known sneakers in the skateboarding world and they're available for men and women. Much like Converse, Vans offer the opportunity to show off your style with colored laces, laced up in intricate (and sometimes even functional) patterns. They're known for the panels of artwork and color splashes. It's easy to find a pair that makes a statement about who you are. Since there are fashion-forward high tops, you don't have to let your image suffer for the sake of ankle support. High tops do a lot of good when it comes to preventing ankle sprains, especially if you're going to be playing sports in them. A study mentioned in Consumer Affairs took a look at 2,500 college athletes and compared the number of ankle injuries in those who wore high tops and those who wore low-cut sneakers. Ankle sprains were less likely in the ones who wore the high top shoes. Find your perfect cool high tops and wear them with pride. Whether you're brand-loyal, looking to branch out, or just want the coolest pair of basketball or skateboarding shoes out of all of your friends, you may find it surprisingly easy-or difficult, if you like them all-to find your signature pair.